Meet "Mythical Beast," a turbine-powered, radio-controlled, flame-breathing dragon. Built by American Rick Hamel, the R/C fictional flame-thrower recently won the "Best in Show" award at the Toledo R/C show, Weak Signals. It's now only a matter of time before the fall of King's Landing. 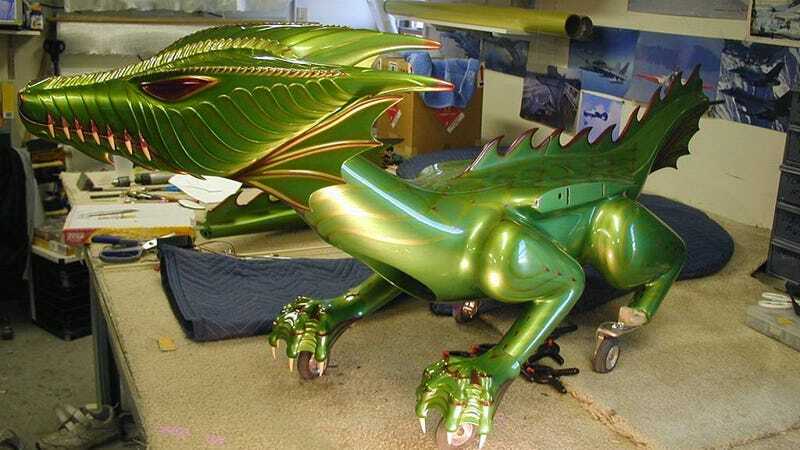 It took Hamel over a year to build this flying dragon, complete with an articulated head, light-up eyes, 600 airbrushed scales, and a jet of propane that, ignited by a stun gun, shoots fire. A nine-foot wingspan, 22 pounds of thrust, and a working rudder make the dragon plane quite maneuverable. There's video of it in flight, and the whine from the turbine makes a decent imitation of a dragon's scream. I would start pledging allegiance to House Targeryen if I were you.